In this section, you can get the instructions to authenticate the users coming to the chat. You can set how users are identified and authenticated. 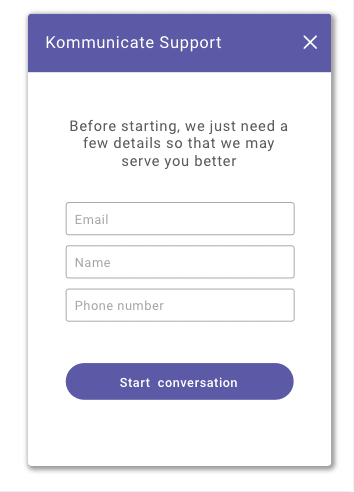 You can also set up lead collection forms to get information from the users before initializing the chat. You can set and update user details in kommunicateSettings function in the Kommunicate chat plugin script. userId This is your user’s/visiter's ID. Kommunicate will generate a random ID if this is not defined. userName This is the display name of the user. Your team will identify the user by this display name. email Email ID of the user. If not online, the user will be notified by fallback emails sent to this email ID. password This will be User's password. imageLink This will be the profile image of the user. conversationTitle All conversations will have this title. Once the conversation is assigned to one of your team, their name would come as the conversation title. authenticationTypeId You can use this to authenticate userId and password from your server Set AccessToken URL and pass the value of 'authenticationTypeId' as "0" (Optional). There are 3 ways to log in users into the chat. appId A unique application ID assigned to your Kommunicate account. conversationTitle All conversations will have this title. Once the conversation is assigned to one of your team members, their name would come as the conversation title. For collecting users' contact information before initiating the chat, use the preLeadCollection method. Once configured, users will see the form on click of the chat widget launcher icon. NOTE: At least one of the (name, email, phone) fields is required. You can collect any custom information from the users as well. Just add the object for that particular information in the code. Let's say you want to collect your user's employment information, you can add that field in a similar manner. "placeholder": "Enter your phone number"
"placeholder": "Enter your company name"
userId Pass the user ID of the logged in user. userName Display name of the user. Your team will identify the user by this display name. email Email ID of logged in user. password Password of logged in user. authenticationTypeId Default: 1 ,you can pass 1 for password verification from Kommunicate server and 0 for access token verification from client server. Once the chat plugin is initialized and has returned success response, then you can use Kommunicate.updateUser(userdetail) method to update the user's details. email Email ID to be updated. displayName Display name of the user. Your team will identify the user by this display name. metadata It is the extra information about the user. You can pass information such as the user's company name and designation. This information will be visible to your team in the Kommunicate dashboard.